Home / Technology / What Issues We Usually Face In Windows 10? What Issues We Usually Face In Windows 10? Windows 10 is considered as smooth by most of the users. But on the other hand there are many users who face problems while using Windows 10. Common problems that Windows 10 Users face are screen flashing, not connecting to the Internet, or the battery draining too quickly, No Sound Windows 10 etc. But now the solutions of common problems are here. 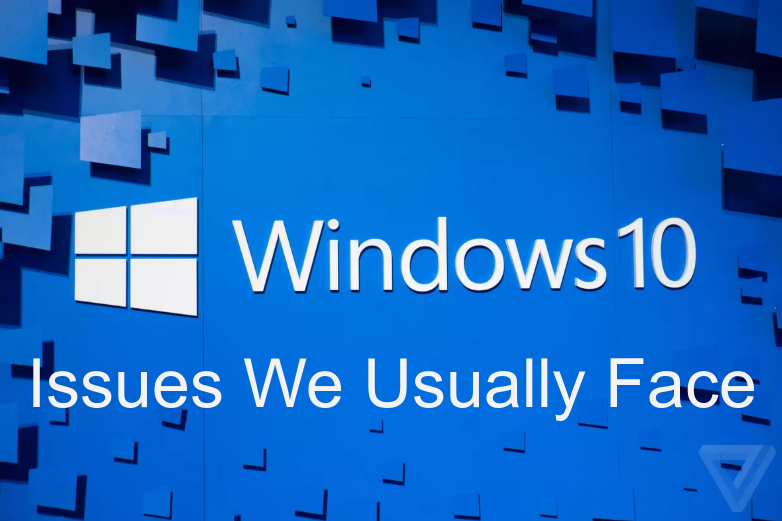 Here in this article we have given the solutions to the common Windows 10 problems. Without downgrading the windows your problems will be solved quickly. First of all check all the physical connections and wire connections done between the speker and the Computer. Sometimes due to wire issue Window 10 No Sound Error occurs. Check all the plugs and jacks and then fix them accordingly. Change the default sound format of the system according to your preference,. Sometimes the default options also create the No Sound Windows 10 problems. Due to software driver also the problem may occur in Windows 10. First of all, Press Windows + X and open device manager on system and then Try different sound formats, turn off the sound enhancements, Run the troubleshooter, or open the device manager, move it to sound, video and game controls. Since Windows 10 forces updates on you, hence it becomes more frustrating when the updating procedure does not complete in a flow. If an update is not correctly downloading then that means the window file is corrupted. Delete all the corrupt files and give your computer a fresh start. To do, you should press Windows Key with R to open Run and input C:\Windows\SoftwareDistribution\Download and click OK. Thereafter delete all the files and restart your device. If you are having a portable device and recently upgraded to Windows 10 then you may find the quick battery drainage problem. Sometimes the new operating system precious the battery life a lot. In order to keep this problem resolved it is important to update all the drivers timely. If all the drivers are up to date then the battery drainage problem will be resolved automatically. If you don't want to follow a lengthy procedure then you may also take help from Cortana, the virtual assistant. This virtual assistant of Windows 10 impacts the device battery to some extent. If you want to save all the power then you have to do a system search for Cortana. Thereafter you need to switch "Let Cortana respond" to "Hey Cortana" to "Off". Are you also facing the problem of windows 10 not opening your images in favorite apps? Or the system browser is defaulted to Microsoft Edge automatically?? Windows 10 is not at all good in reminding all the recent changes. It becomes difficult and painful 3 configure all the applications. Furthermore, it is easy to change all the default applications. Change the default apps you need to press window key + I and select System. Thereafter you need to choose Default apps options. Now you will be able to alter the default application for your media files. Is your system not detecting the Wi-Fi connection? This problem sometimes happens due to the VPN software you have installed in your device. The VPN software affects the Ethernet connections. To solve this problem you have to go to the VPN software website and update it to the latest version. While updating must ensure that the version is compatible to Windows 10. If still the problem persists then press Windows Key + X and select Command Prompt (Admin). Thereafter a dialogue box will appear in front of you. You need to enter the following two lines in a dialogue box. If still, the problem persists then it may be related to the driver. For that you need to expand the Window Drivers. Hence these are the common problems users face while using Windows 10. If you are facing any of the issue given above then you may try the above-mentioned solutions. These will definitely help you out. Remember after completing the procedure it is important to restart the device.